My dad was a firefighter, so I know all too well the importance of having life insurance. If the unthinkable would have happened, our family would have been devastated emotionally and financially. This article is going to address the coverage options available and find out if life insurance for firefighters is affordable. >>Need help now? Please contact us by email or call us toll free at (888) 411-1329. A licensed Life Insurance Blog agent will help you right away. Let’s cut to the chase. Your occupation is extremely dangerous and you’re probably wondering if you can get even get life insurance. I’ve got some great news for you. You can get life insurance. Negative. Just as long as all the usual qualifying factors are ok, you can actually get the best rates! In other words, it’s possible to get “Preferred Plus” rates as long as your health, weight, family history and other underwriting factors are normal. Most people would bet that a firefighter would be tagged as a high risk life insurance occupation. There are so many risks that come with the job. Fires, traffic and hazardous material just to name a few. Here’s the thing – all of the top life insurance companies and their underwriters look over tons of data. That data shows that overall, the chance of a firefighter dying is very small. In fact, less than 100 firefighters die annually. Before you apply, it’s always a good idea to do a few things. First, get some life insurance quotes. You can compare rates right on our website here. Once you get quotes, you should have an independent life insurance agent (*hint Life Insurance Blog) gather some details about your unique situation. Here’s why: All life insurance companies have their own qualifying guidelines. You could apply with 3 different companies and could be rated 3 different ways. Your agent is like a your personal detective – they research every company they can to find the one that will give you the best deal. At Life Insurance Blog, we have access to dozens of carriers. We use this huge network to find you the best deal. We can help you every step of the way. From researching companies to processing the application. We even have several types of policies to choose from. Let’s review those now. Term life will be the least expensive because it’s temporary coverage. This means that it won’t cover you for your entire life. Term life is usually purchased in 10, 20, or 30 year terms. It’s a great policy to cover you during your working years. For example, term can cover your mortgage, your children’s future college tuition or simply replace your income. Permanent life insurance is a general term that describes policies that provide lifetime coverage. Policies such as whole life, universal life and guaranteed universal life are all permanent policies. They also can grow cash value tax deferred. Most policies require a medical exam before you’re approved. The good news is that there’s an option to skip it. There is such a demand for no medical exam policies that more and more companies are offering it. You can get your policy conveniently by answering some basic questions and get approved much faster. No medical exam policies are usually for term, but there are some permanent options too. 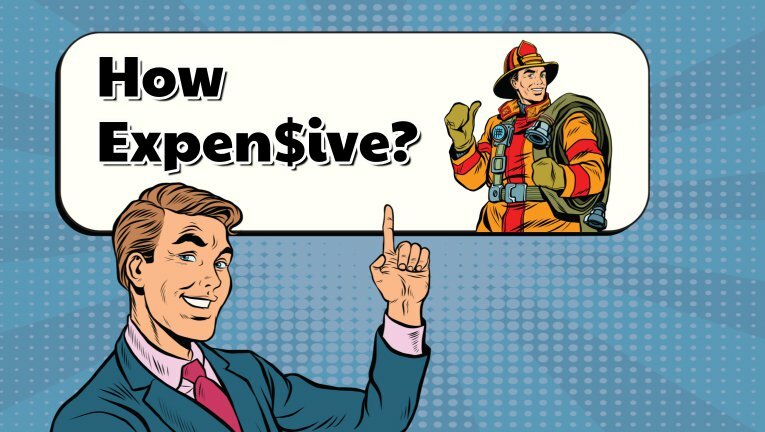 How Expensive is Life Insurance For Firefighters? As we mentioned earlier, your rate will be bases on the typical underwriting process. You won’t get rated up because you’re a firefighter or EMT. You can quickly and easily run a quote using our instant life insurance calculator. Compare rates based on policy type, coverage amount and various health classes. You can also contact us directly and we’d be happy to provide you a customized quote. Look firefighters are heroes and save people’s lives everyday – but your agent can save you thousands of dollars over the life of your policy! We’ll find the company who will approve you with the best offer. The best part – if you’re approved at a rate higher than the quote (maybe due to something in the medical exam), we’ll simply take those details to our network of companies to get you approved. You won’t even have to take another exam! If you or your family member is a firefighter we’d be honored to help you secure affordable life insurance coverage. We’re here to help answer all your questions and provide you all your options. Like we mentioned before, we don’t use just 1 company – because we use over 60 life insurers for our clients. Give us a call at 888-411-1329 and let’s see what we can do for you today!